Good day everybody and welcome to drawing tutorial on how to draw Wolverine from X-Men! In fact we already have a few lessons about the most charismatic character of the X-Men – classic Wolverine and original Wolverine (yes, the differences in these lessons are more than may appear at first sight) and lego Wolverine. The main backbone of a human is his skeleton. The wolverine skeleton is covered with a layer of adamantium – the hardest metal in the Marvel universe. But besides this his skeleton is no different from the skeleton of an ordinary man. So we sketch the skeleton as our example and move on. If you look at this step, you will find that there are so many new lines and shapes that you can get confused. But do not be afraid, everything is much easier than it seems. In fact, we just need to give volume of each part of the body using ordinary geometric shapes. We advise you to draw from the top down, in this lesson it is especially convenient, because Wolverine here is standing straight (but of course you can choose another pose). Here we draw one of the most distinctive parts of Wolverine suit – its ears (horns?) which are somewhat like horns on costume of Batman. 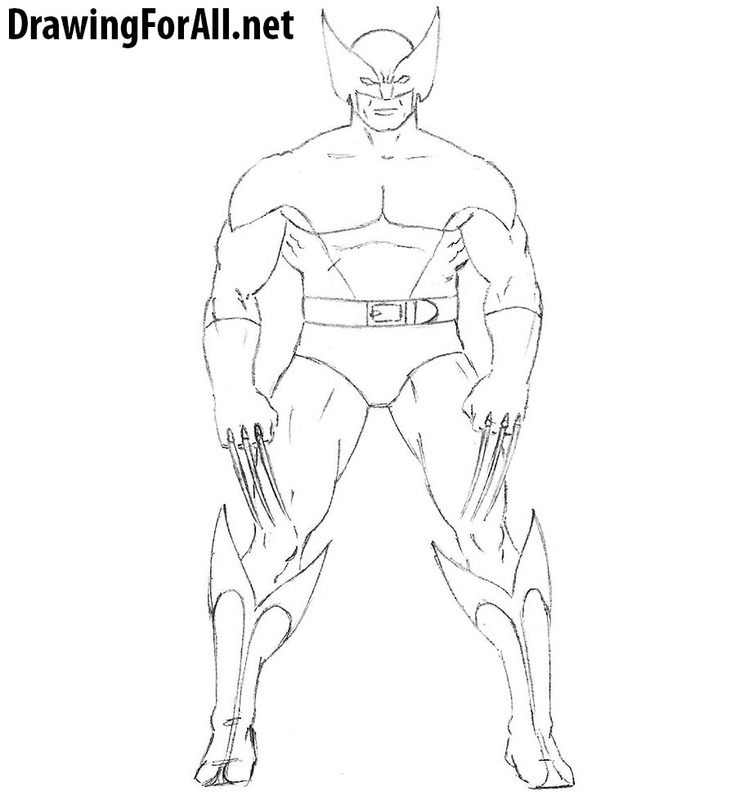 By the way if you want to learn more visit the lesson on how to draw Wolverine’s head. We continue drawing Wolverine’s head. If you have already visited the lesson about the head of wolverine and have studied it, then in this and next step you will not find anything new. So draw eyes of Wolverine and his mouth. Also you can add lines of cheekbones. Here we finish drawing Wolverine’s head. Before we draw the entire head, remove all the extra lines and strokes from the previous step. Carefully draw wrinkles that are located around the mouth and between the eyes. We finished the head and go to the body. After the head draw the neck sketch out the lines of the muscles of the neck. 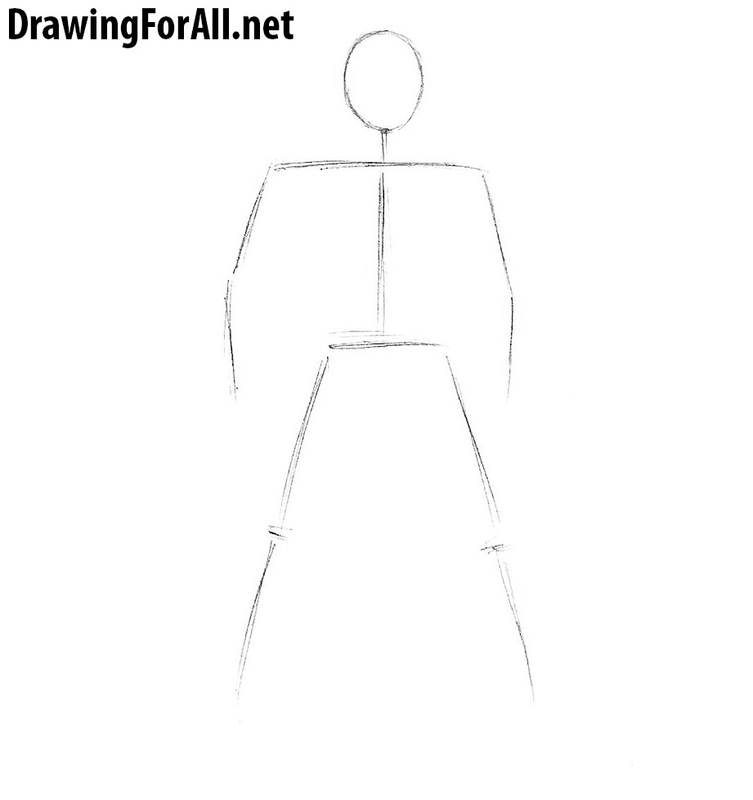 Erase the lines of the “spine” and circle the lines of the torso. Draw the pectoral muscles and sketch the lines of the muscles of the abdominals. At the same step draw a belt (note that in many costume designs there is a sign of X-Men in the center of the belt). 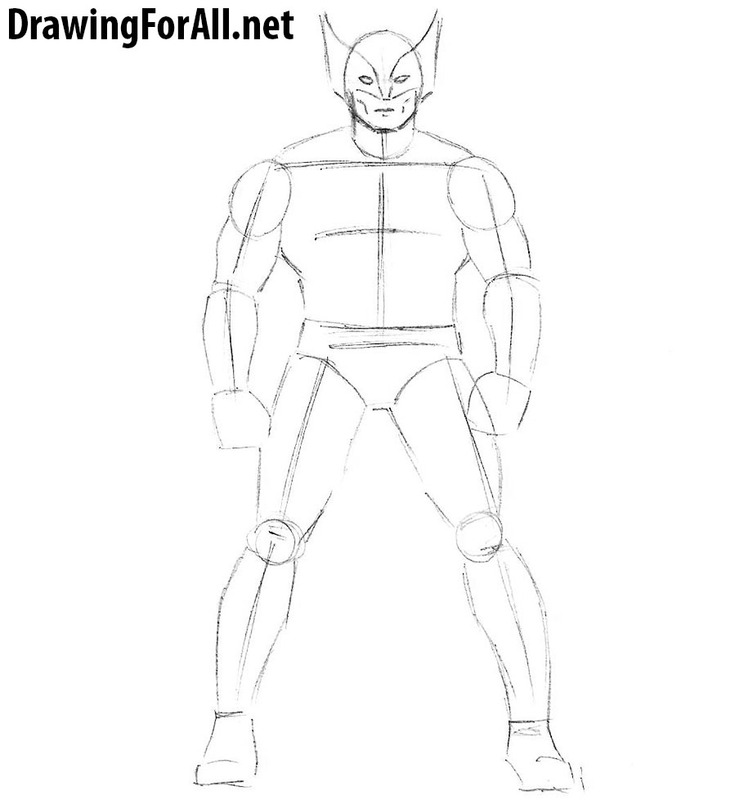 So, we continue drawing Wolverine and go to the arms. Mark the muscles of the arms, that is deltoids, biceps, triceps and forearm muscles. Continue the line from the chest that is edging the deltoids. Sketch out the lines of gloves and move on to the most distinctive part of Wolverine – his claws. 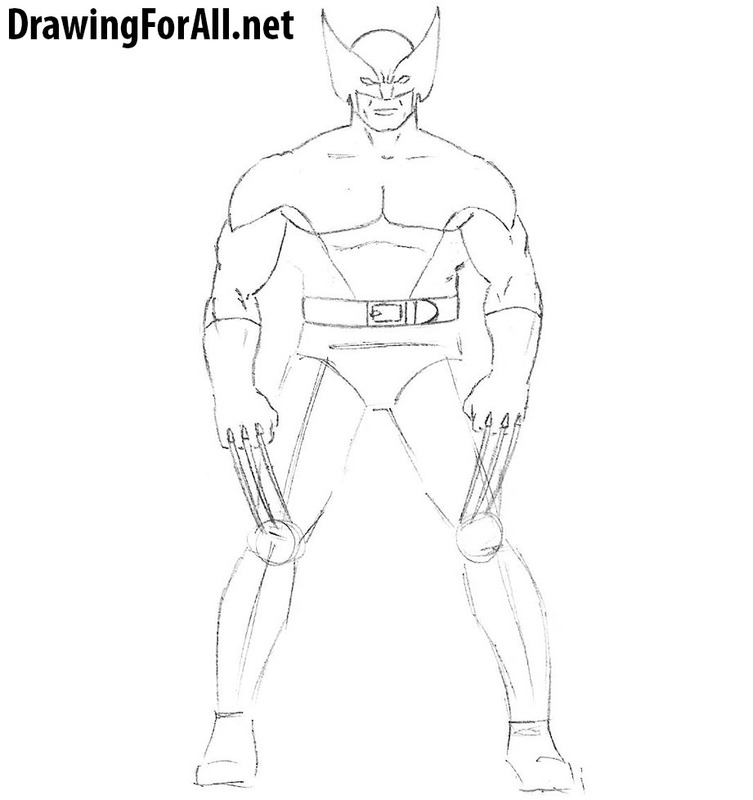 Draw fists and long and sharp claws (visit the lesson on how to draw Wolverine’s claws). We continue to draw Wolverine. 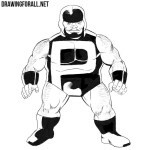 Draw Wolverine shorts (why do superheroes wear shorts over the pants?) and move to the legs. Carefully draw out the legs drawing the lines of muscles, such as quadriceps and calf muscles. 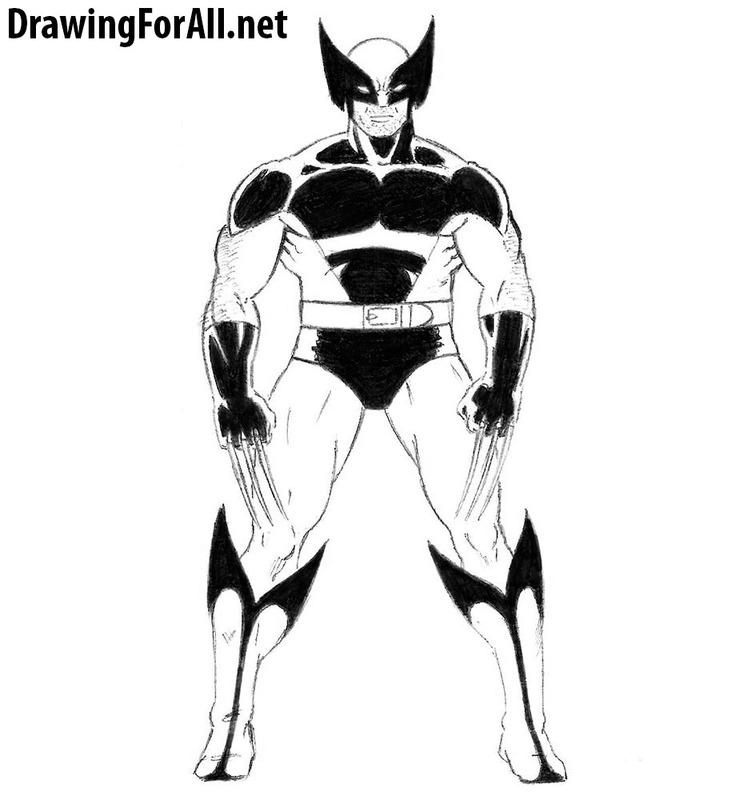 Draw very strange and unusual boots of wolverine that are very similar to his own mask. Here we finish the lesson on how to draw Wolverine from X-Men. The last steps in all lessons about superheroes are very similar to each other, because here we draw shadows. First we draw out the outlines of the shadows and then paint over the outlines of the shadows. 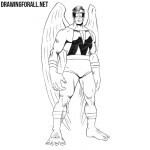 As you know, we like comics very much and we have many drawing lessons on how to draw comics. So do not forget to visit lessons dedicated to the Amazing Spider-Man, Superman, Thor and The Incredible Hulk. And of course share this lesson.